Let me put that statement into American English. Paul wants more money. He thinks that because they’re the Beatles they should be getting a better slice of the pie than everyone else does. 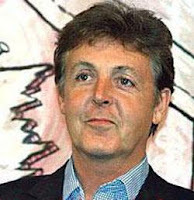 Don’t fall for Paul’s good-natured Liverpudlian moptop doofball act. I’ve never in my life seen a guy claw after a few pennies like this guy does. And my second job involves working in Hollywood, so believe me, I’ve seen some real champs in this department. Heck, I’m no slouch myself. This Beatles thing puts me in a weird position and forces me to ask myself, what do I love more — the Beatles, or money? And how willing am I to let some musicians push me around? Well, I love the Beatles. I think they’re great. But if the Beatles want to miss the next big wave of music sales, ultimately that’s their decision and they can live with it. Namaste, Paul. I will pray for your soul.